I used leftover duck from the night before and shredded the meat off. If you wish to cook the duck on the day just follow the instructions according to the packet. Heat the oil in a saucepan on a medium heat, add the garlic and ginger paste and stir it all in for about a minute. Add the spring onion and chilli and cook until the spring onion has wilted. Add your chicken stock to your pan along with the diluted cornflower. Whisk it in with a balloon whisk and turn the heat up until it comes to the boil. Turn down the heat then add the soy sauce and ground coriander, give it a good stir. Add the shredded duck and leave on a simmer for about 25 minutes, the juices from the duck will help flavour your soup. Add the tinned sweetcorn to the soup then bring it back up to the simmer. Taste your soup seeing if it needs any more soy sauce. Whisk both eggs in a jug with a fork, take your soup off the heat and then pour in the eggs, slowly stirring as your go. Your soup will become lighter and the egg will become string like. Season with white pepper. 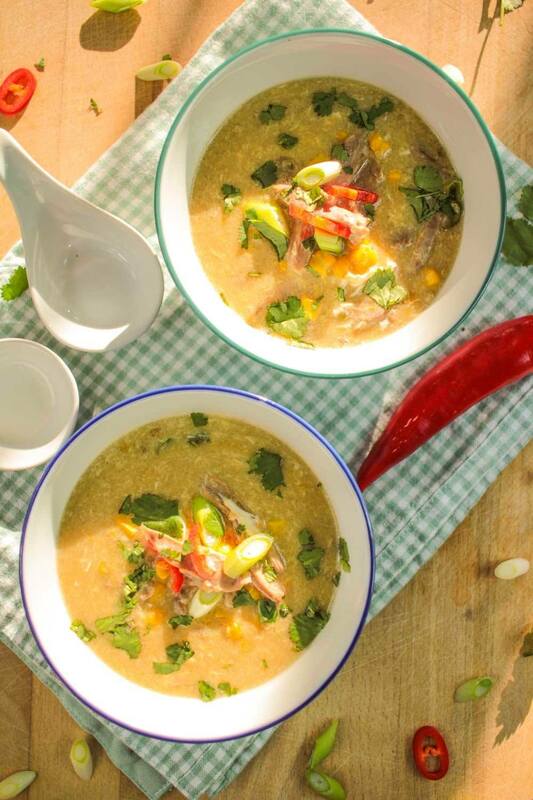 Ladle the soup into bowls and garnish with red chilli, spring onion and fresh coriander. Enjoy!